Individual tickets are available for $150, a table of 8 for $1,000 as well as sponsorships from $5,000 to $10,000. Please visit the Positive Coaching Alliance website or email Amy Sinclair at amy_sinclair@positivecoach.org or call (612) 910-0469 for more information. Chad Greenway is a former NFL linebacker who played his entire 11-year career for the Minnesota Vikings from 2006–2016. Greenway is a two-time Pro Bowl selection for 2012 and 2013 plus Second-team All-Pro for 2012. Greenway is also the winner of the Byron “Whizzer” White NFL Man of the Year Award for 2015. Sports Speakers 360 is a booking agent for pro athletes. 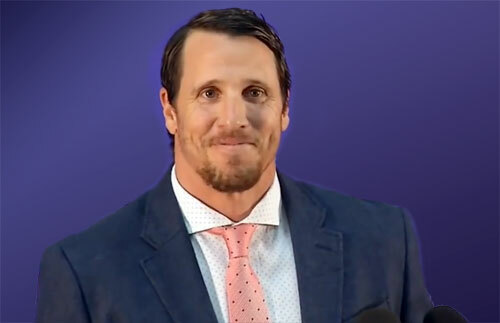 If you would like to book Chad Greenway for a speaking engagement, appearance or endorsement, contact a Chad Greenway booking agent for fees at 1.855.303.5450.